Learn how to deal with life. I've heard every one of those statements when speaking to someone about my daughters anxiety disorder. I truly believe these comments come from a heartfelt place, I have to believe that. And though those statements are hard to hear, and send a pang of sadness to my heart, I know it's simply because they are uneducated about anxiety disorders. So with this blog post, I want to give you a glimpse into parenting a child that has been diagnosed with Anxiety Disorder, Panic Disorder, slight OCD and Dyslexia. With an anxiety disorder, the anxiety is daily, if not multiple times a day. It can happen during the day, or it can wake you out of a sound sleep. The symptoms are countless; heavy breathing, weakness, dizziness, vomiting, racing heart, migraines, mental exhaustion and a list of symptoms that can go on for pages. Once the attack is over, exhaustion sets in. I'm in these trenches daily, and I can assure you that just getting over it isn't a possibility. If it was, don't you think she would have chose that option a long time ago? The debilitating problem with anxiety and panic disorders is that you simply can’t calm down. 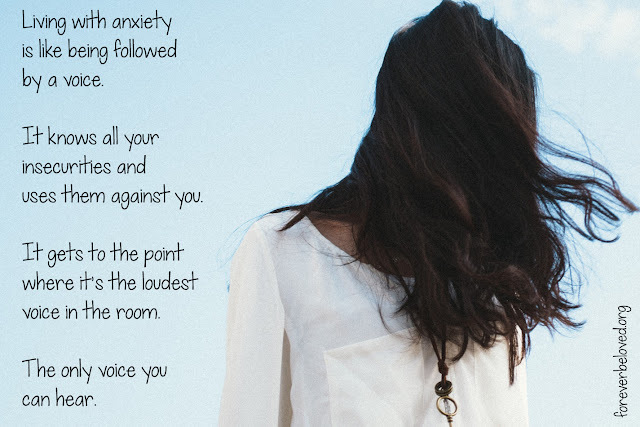 There’s this stigma about anxiety that it’s just fear and being nervous. That doesn’t even come close. Many times with her anxiety attacks, she has no idea what the trigger even was. Waking in the middle of the night in the middle of an attack. Lying in bed at night reading a book, and an attack comes on. How do you prepare yourself for those? Do you know how many teens are in crisis? In the throes of mental illness or depression? MILLIONS. So do the math: that means millions of parents are suffering alongside teens that are suffering. An easy target for judgment or shame, so many families in crisis struggle alone, afraid or embarrassed or just too exhausted to reach out. Society expects three-year-olds to act like raging lunatics, but yet we don’t know what to do with a teen that has debilitating anxiety attacks. Because we live in a society where blame has to be placed, so often parents get the side eye: What did you do wrong? What didn’t you do right? What could you have done differently? Why do you baby them? There is no parenting formula that ensures any child’s path. Families in crisis don’t need a jury of their peers; they need a community of support. Then there is the very real reality of mental illness and emotional disorders that many teens are battling. If a child had liver failure, we would support those parents wanting to go to the ends of the earth for medical care. We would be the greatest support network, and all the earth would rally to fight for their health. Yet, so many of our teens are physically broken in their minds and hearts. But instead of a chorus of support, their families receive silence or judgment or disappointment which compounds grief and lays a heavy yoke on those who are already suffering. I want you to know what it's like to be a Mama to a child with severe anxiety. I want you to read my words. To feel, if even for a moment, how I feel. And to try your best to understand. It is sitting in the bathroom with your 5-year-old daughter during a thunderstorm. Reassuring her that it will be over soon. And sitting patiently with her while she vomits for hours. It is climbing to the very top of an inside playground, because my 6-year-old is frozen in fear and afraid to come down herself. It is your 7-year-old enduring two months of bedtime vomiting because she thinks she may have ate something that would cause her to die. It is taking your third-grader to therapy for an eating disorder. Telling her that even though they had an assembly on "healthy eating", that doesn't mean she should just choose not to eat for fear of every food choice being unhealthy. It is countless trips to the school to sit through meetings. Listening to her be called lazy, inattentive and compared to her older brother. Begging for years for them to listen to my mother instinct, and test her for dyslexia. And endlessly being my daughters advocate. It is always ordering her food for her and speaking for her because of her fear of saying the wrong thing. It is always accompanying her to the buffet because of her fear of going alone. It is avoiding stressors will cause an instant trip to the bathroom to vomit. It is always having a plan and a way out. It is taking your 14-year-old into a funeral home. And when you walk in, she freezes and is unable to speak or walk. It is helping her through the funeral home until you can get her to the car. It is scurrying to shut the TV or radio off as soon as a storm or tornado warning comes on, and hoping she didn't hear it. It is watching her suffer through a flair-up that lasts weeks on end. Daily vomiting and losing nearly 20 pounds. It is your Mama heart breaking over and over again because you feel so helpless, but wish you could take it for her. And crying silent tears into your pillow. I can reassure her. I can encourage her and prepare her for change, but I can not take her anxiety away. It is having a front seat to her life, watching her grow into a kind, tenderhearted Jesus loving girl. A girl who has such a heart for kids with special needs because of her own struggles. It is listening to her quote verses and telling you the night before she prayed during her anxiety attack. It is so much more than just needing to grow up and learn to deal with life. This is our life. This is our normal.